In Kabir Khan’s thriller, David Coleman Headley is dead and other nationalistic fantasies come true. Stop the presses: David Coleman Headley is dead, the plotters of the November 26, 2008, attacks in Mumbai have been extinguished, and anybody who believes that India is a soft state can go to Pakistan. To be fair, the tagline for Kabir Khan’s Phantom does describe the plot as a “story you wish were true”. Khan’s political thriller, baggily based on Husain Zaidi’s novel Mumbai Avengers, conjures up a scenario in which the Research & Analysis Wing launches a covert operation to kill the people behind the brutal assault on Mumbai. Saif Ali Khan’s ex-army officer teams up with Katrina Kaif’s security analyst to cull targets that include Headley, the Pakistani-American double agent who conducted the reconnaissance mission that preceded the attacks on the Taj Mahal and Oberoi hotels and the Chhatrapati Shivaji Terminus railway station, and the head of the Laskhar-e-Toiba, the Pakistani terror group that executed the operation. The screenplay by Khan and Parveez Sheikh does not even bother to change Headley’s name, but since the real person is currently serving a lengthy prison sentence in America, he presumably cannot sue. At least LeT chief Hafiz Saeed is rechristened Harris Saeed. 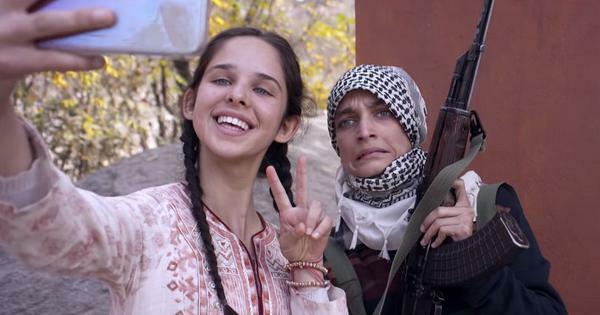 But here too, the physical resemblance is striking enough to cheer dispirited Indian taxpayers who have been vexed by the same question that has haunted filmmakers of late: Why can’t we be like America and Israel and hunt down our enemies? Israel went after the Palestinian terrorists involved in the deaths of 11 of its Olympic team members in Munich in 1972, while America avenged the September 11, 2001, attacks by gunning down Al Qaeda chief Osama Bin Laden in his Pakistani hideout in 2011. Both these events were fodder for Hollywood movies. If India cannot capture its foreign enemies in real life, what is stopping Hindi filmmakers from doing so in their scripts? Phantom is the latest Bollywood movie to wage war on behalf of the Indian state and give unsolicited advice to the government and intelligence agencies on how they can do their jobs better. The writers also have some advice for Pakistan in general (terrorism is bad for you!) and its intelligence community in particular (ditch the fax and upgrade to face-recognition software!). The filmmakers dream up situations in which Khan’s character Daniyal Khan and Kaif’s Nawaz Mistry not only survive a gun battle between ISIS members and the Syrian army, but also deliver vigilante justice in the heart of Lahore. An eye for an eye truly does make some writers blind. One big challenger to Phantom’s impossible mission is its timing. Nikhil Advani’s D-Day extracted a Dawood Ibrahim-like gangster from his hiding place and executed him back in 2013. Neeraj Pandey’s Baby, released earlier this year, avenged terror attacks on India by picking out the plotters in neutral territory. Both films depict crack teams of highly trained, committed and fearless individuals who put their nation’s honour over their own lives. Perhaps to distinguish itself from its recent predecessors, Phantom jettisons its faith in team work and puts the mission in the hands of Daniyal and Nawaz. This ill-matched pair of superhumans is backed by a RAW team in Delhi that is headed by Roy (Sabyasachi Chakrabarty) but is driven by the ideas of junior officer Sumit (Mohammed Zeeshan Ayyub). It is Sumit’s idea to punish the terrorists, unlike in the source novel, in which a retired military officer spearheads the complex operation and provides military, financial and technological assistance with RAW’s covert blessing. It’s still fiction, but at the fringes of plausibility. Daniyal and Nawaz, in contrast, make it look immensely easy even though this is their first such operation. For all its Hollywood pretensions, Phantom resembles 1970s spy movies in which multi-tasking lone wolves tear apart the enemy’s defences alongside romancing beautiful women and singing songs. If Saif Ali Khan, who has saved India from nuclear Armageddon no less in Agent Vinod, looks unsure and unsettled in most of his scenes, it is not entirely his fault. The plodding pace, choppy editing and amateurish exposition are relieved by slick action sequences, suitably dressed-up foreign locations (including Beirut) and convincing production design. Every effort has been made to make sure that this delusion of vengeance looks as close to the real thing as possible, right down to the actors who play Headley and Hafiz Saeed. This is art imitating a fantasy about life, made with the hope that life will eventually catch up with art.